I came across a word the other day and I thought it sounded just wonderful, but was utterly unsure of its meaning. Where was this word being displayed? Ironically it was at the British Library, which is no ordinary library, so I found a dictionary, yes, a heavy, ruffled dictionary and looked it up…newfangledness.. Turns out it’s my new favourite word. It means ‘excessively fond of new ideas or fashions…liking new things.’ Therefore I am newfangled over newfangledness. It might be one of those words that is best written & understood rather than spoken out loud in conversation eg. “Why it’s certainly true, I do like newfangledness; the future holds many new, bright and aspiring fresh themes…” Let’s not turn a lovely word into an intellectual social enemy. Don’t get tangled up in newfangled! 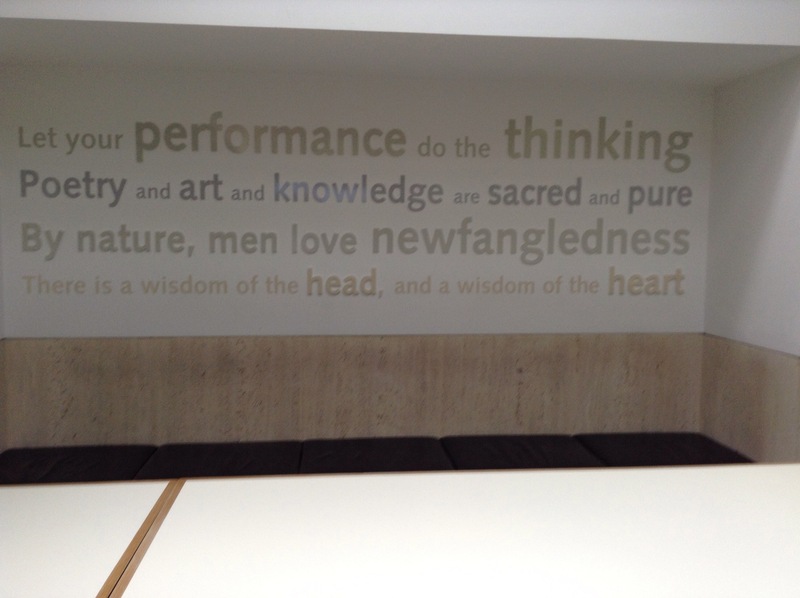 Here it is on display, where I first read it, amongst all the other words that I do know and love…Poetry, Art, Knowledge, Sacred, Pure, Performance, Thinking, Wisdom, Nature, Head & Heart…oh and let’s add Women next to Men who love newfangledness.